Karnataka tourism minister Sa Ra Mahesh said to Congress workers that if they fail to cooperate with the JD(S) in Mandya, the party will ditch Congress in Mysuru and other MP segments. Sources say it is Siddaramaiah’s idea to push Sumalatha into politics to checkmate JD(S) and ensure Congress’s presence in Mandya. Bengaluru: A day after the JD(S) leader and tourism minister Sa Ra Mahesh issued a warning to the Congress asking them not to 'cheat' the party in Mandya, JD(S) sources say that it is Siddaramaiah, who tutored Sumalatha to stake claim over the Lok Sabha constituency in an attempt to continue late actor-turned-politician Ambareesh's legacy. After the demise of Ambareesh in November, the family had not made any comments about their political interest. It was only after JD(S) started to project state chief minister’s son Nikhil Kumaraswamy as an aspirant from Mandya in December, Siddaramaiah is said to have planned this move. 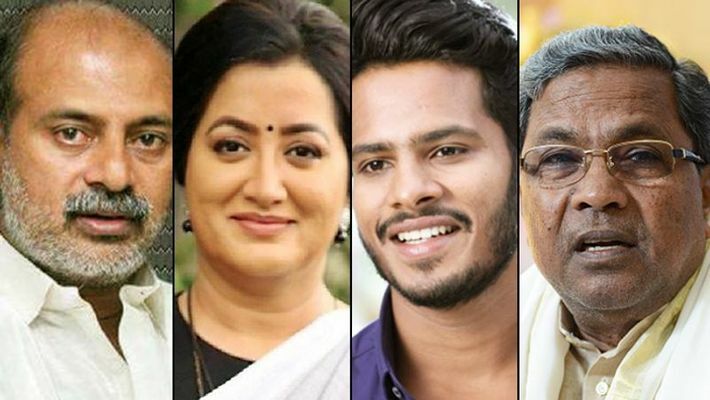 Sumalatha also met Siddaramaiah asking him to speak to party leaders and ensure she gets the ticket from Mandya, but sources that this was pre-planned. Recently, Congress leader H Ravindra staged a hunger strike against Nikhil Kumaraswamy being fielded as Mandya MP candidate. This protest is Congress leaders’ handiwork, say sources adding that many may work against Nikhil Kumaraswamy in the election. Dinesh Gundo Rao, Karnataka Congress president said, "This is off-the-cuff news and is very trivial. There is no need to blow things out of proportion." JD(S) leader and Special Representative to Government of Karnataka in Delhi, Mohid Altaf agreed that it was Siddaramaiah, who initially vouched for Sumalatha and asked her to join the party officially. “However, after the discussion in the coordination committee meeting and consultation with JD(S) chief, Siddaramaiah is said to have told Sumalatha that the seat is left to the JD(S),” Altaf said. "The statements of Sa Ra Mahesh is wrong. Even Siddaramaiah has reacted to this saying that there should be mutual trust between coalition partners. He initially wanted to field Sumalatha and after the seat-sharing, he was vocal about the seat going to the JD(S) and told her he cannot do anything about that as per coalition compulsion," said Altaf. The statements reflect a lack of trust between Congress and the JD(S), says BJP. The Mandya commotion, which has turned the fight into a ‘Ambareesh's fan club versus JD(S)’ instead of ‘BJP versus Cong-JD(S)’, has given hope to the BJP to increase its vote share or even may emerge as the dark horse. BJP, in order to defeat the JD(S), may not field any candidate and perhaps support Sumalatha. "The statements of Sa Ra Mahesh who said, 'if you cheat us in Mandya we will reject you in Mysuru,' are very reflection that there is a lack of mutual trust between coalition partners. The JD(S) is on a shaky wicket in Mandya following their dirty family rule. The voters are upset as they think JD(S) wants MLAs, MPs, ministers and even zilla panchayat presidents from their family alone," said S Prakash, BJP spokesperson.